This product was added to our catalog on Monday, 03 February, 2014. Specially-Formulated for Stainless Steel Exhaust Systems! Keep your BORLA® system looking new with BORLA® Exhaust Cleaner & Polish. Using a state-of-the-art formula, it quickly cuts through layers of dulling oxides to restore original finish while adding tarnish protection. Use it on cars, trucks, motorcycles and boats, or other household and shop cleaning projects. Also cleans and polishes chrome, copper, brass, aluminum and other metallic surfaces. Borla® Exhaust has been designing and manufacturing high performance, aftermarket exhaust systems that carry a million mile warranty for over 3 decades. One of the reasons we have been able to stand behind our products with such a powerful warranty for so many years is because we have always and will continue to exclusively use austenitic stainless steel in the manufacture of our exhaust systems. While this material lasts over a million miles and will not rust, the exhaust systems from which this material is made will build up dirt, engine residue and other unwanted impurities over time that dull the finish. Through the years we have received many requests for a cleaner/polish that restores the finish of a Borla® exhaust to the way it was when it was new but we were unable to find one that worked especially well with the austenitic stainless steel used in Borla® products. The metal polishes on the market were designed to work with many different types of metal and therefore did not do the best job possible on austenitic stainless steel. 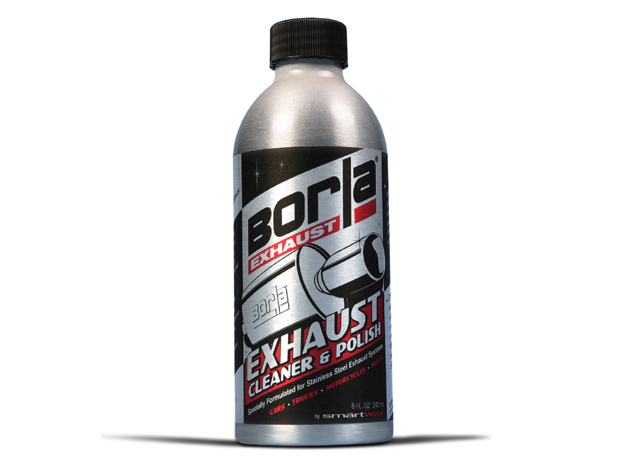 After years of testing, Borla® has finally developed an exhaust cleaner/polish that is specifically designed to work on stainless steel exhaust components for cars, motorcycles, boats, trucks etc. Exhaust systems deal with specific elements like heat cycling, condensation, oxidation etc. that create unwanted affects to the material which are specific to exhaust. BORLA®'s new polish is designed ONLY to counteract these affects and as a result performs better for this purpose than anything else available.